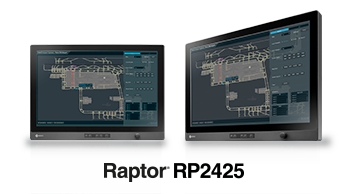 Wolfrathausen, Germany, February 28, 2017 – EIZO today announced the new Raptor RP2425, a 24.1-inch touch panel monitor with 1920 x 1200 resolution for air traffic control (ATC) towers. The Raptor RP2425 adds to EIZO’s already extensive lineup of tower monitors, which now ranges from 19 to 24.1-inch with resolutions of 1280 x 1024 to 1920 x 1200. With this full range for tower control, EIZO continues to provide diverse options that meet individual tower requirements. The Raptor RP2425 is equipped with a projected capacitive touch panel that features reduced reflection, touch durability, and multi-touch support. The monitor is fully-flat for a seamless touch experience. A non-touch variation is also available for tower applications which do not require a touch interface. The monitor achieves an exceptionally wide brightness range from 10 to 700 cd/m2 (750 cd/m2 for the non-touch version) for comfortable viewing in the changing ambient lighting conditions of ATC towers. It also includes an adjustment dial, providing tower operators with smooth brightness control. EIZO’s fully automated backlight stability function uses an internal sensor to stabilize the brightness level throughout the lifetime of the monitor, compensating for fluctuations caused by variations in ambient temperature and the passage of time. Antiglare protection glass on the monitor ensures that the screen maintains high visibility even in bright ambient lighting. The Raptor RP2425 is developed specifically to meet the stringent requirements of mission-critical ATC tower environments with 24/7 operation. It uses full sheet-steel industrial-grade housing for durability and high performance in such demanding environments. The monitor also provides noiseless, fanless operation while still maintaining low heat output for protecting components. EIZO offers extensive customization of the Raptor RP2425 so system integrators and ANSPs can optimize the monitor to best suit their needs. Customization includes, but is not limited to, mounting configuration, cabinet color, and touch and non-touch variations. EIZO will be showing the Raptor RP2425 for the first time at World ATM Congress 2017 in Madrid, Spain March 7 – 9, 2017. Visit Booth 349 to see a live demonstration of the product. The Raptor RP2425 is now available. Please contact atc@eizo.com for details.